Whether you are a regional manufacturing facility serving your local area, or a global or national manufacturing business with worldwide fulfillment capabilities, growing your client and employee relationships is crucial for expanding your business. The Incentivefox team creates a custom campaign that spans each of your unique channels, to empower your customers to become your most effective sales tools. Collect qualified leads and supercharge your promotions with a desirable incentive that customers genuinely want. It all starts with a company branded, reloadable Visa® Prepaid Card. Discover your most loyal customers, top performers, and ROI utilizing the Incentivefox dashboard. Power your additional incentive programs using one easy portal and send rewards with 3 simple clicks. Saving you over 30 minutes per check or gift card mailing. We help you deliver more personalized, branded, in-store promotions that fit your shopper’s appetites. Incentivefox will help you create promotions that drive business and showcase your latest offers. Utilizing in-store flyers for your service areas, waiting rooms and even sales desks, if applicable. We can even provide company branded reward card samples. Run as many referral, reward and retention campaigns as you’d like. Start and stop when you need to. With the Incentivefox platform you can gamify all of your audience’s or just one sector. Read more about the incentivefox marketing campaigns here. The Incentivefox team will work with your website developer to integrate your referral submission page into your site. The Social Media landscape is a competitive marketplace; Incentivefox will help keep your social content fresh by providing you with promotional images and content to engage your past and potential customers. We’ll also partner with your ad agency. Personalized email marketing campaigns geared towards your customers. Target customers’ interests and encourage a call to action. Email up to 10,000 participants a month for optimal engagement. Additionally, your customers will receive reminders about sending in referrals, receiving rewards and downloading your app. Personalize your automated email follow-ups and attract new, quality customers by acknowledging their interaction with your company. The platform sends you new leads and reminds you to stay engaged. Each lead you receive will be pushed into your CRM to track your Incentivefox referral program success. Enjoy the benefits of a robust, full-service rewards suite. 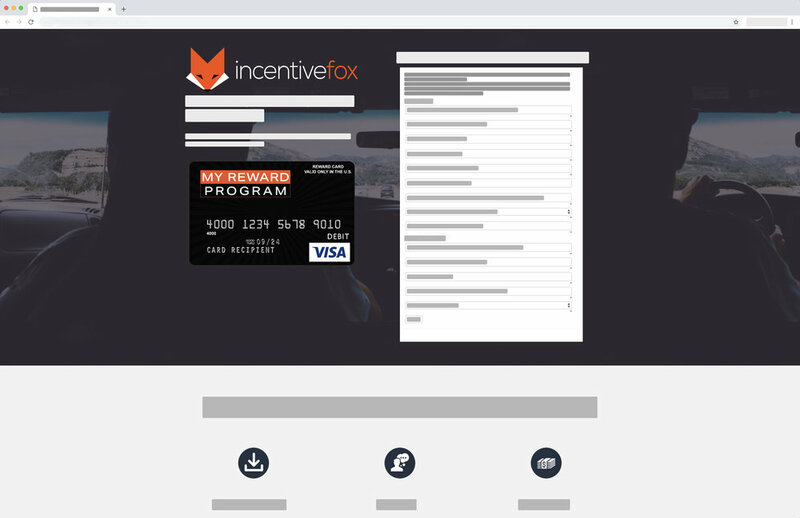 Incentivefox brings you the ability to award recipients with a customizable, branded Visa reward card. Additionally, we can fulfill digital gift cards and other exciting promotional items. It takes less than 30 seconds and just 3 clicks! With the Incentivefox platform, you'll never miss a referral lead again. You can track leads from start to finish. And receive instant updates about new leads and successful deals. We want your program to be an out-of-the-park successful; which is why we assign a Client Success Manager to oversee virtually every aspect of the day-to-day activities of your programs. This individual is determined to make your partnership with Incentivefox an outstanding experience. By utilizing the data Incentivefox provides, you can make informed decisions about the direction of your relationship marketing programs and promotions. Let us show you how to attract new clients using historical analytic patterns to drive your business forward.